The 2008 U.S. presidential campaign has provided a lifetime's worth of surprises. Once again, however, the nomination process highlighted the importance of organization,political prowess, timing, and money. And once again, it raised many hackles. The Democratic contest in particular generated many complaints ?for example, it started too early, it was too long, and Super Tuesday was overloaded. This timely book synthesizes new analysis by premier political scientists into a cohesive look at the presidential nomination process ?the ways in which it is broken and how it might be fixed. 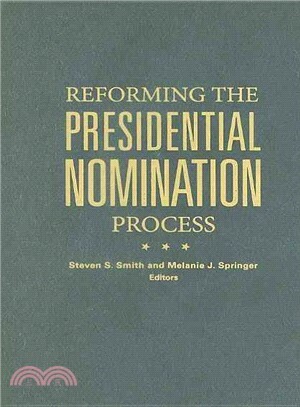 The contributors to Reforming the Presidential Nomination Process address different facets of the selection process, starting with a brief history of how we got to this point. They analyze the importance ?and perceived unfairness ?of the earliest primaries and discuss what led to record turnouts in 2008. What roles do media coverage and public endorsements play? William Mayer explains the "superdelegate" phenomenon and the controversy surrounding it; James Gibson and Melanie Springer evaluate public perceptions of the current process as well as possible reforms. Larry Sabato (A More Perfect Constitution) calls for a new nomination system, installed via constitutionalamendment, while Tom Mann of Brookings opines on calls for reform that arose in 2008 and Daniel Lowenstein examines the process by which reforms may be adopted ?or blocked. Steven S. Smith is the Kate M. Gregg Professor of Social Sciences at Washington University in St. Louis, where he directs the Weidenbaum Center on the Economy, Government, and Public Policy. His many books include Party Influence in Congress (Cambridge, 2007). Melanie J. Springer is an assistant professor of political scienceat Washington University, where she is a fellow in the Center on Political Economy.